I saw these cupcakes somewhere on the internet and I thought they looked like so much fun. I used Smarties (a Canadian version of M&Ms) because the colours are much more varied. These silly fish cupcakes flew (swam?) out the door on SPCA Cupcake Day. So happy to be able to help out. I love succulents! Their shapes. Their shades of dusty green. Their variety of unique shapes. I decided to try making them out of buttercream for cupcakes to raise money for SPCA Cupcake Day. These were pretty popular and didn’t last long. Win-win! I had fun making them and the critters at the shelter will be taken care of. Perfect. I love hedgehogs and I thought these would be perfect for this year’s SPCA Cupcake Day. I guess no one could resist a cute buttercream hedgehog sitting on a chocolate cupcake. They sold out in no time and all the profits made went to our local animal shelter. Win-win! Every year for the past five years, I have donated cupcakes to a good cause: SPCA’s Cupcake Day where all the money raised from cupcake sales goes to help support our local animal shelter. This year I did floral buttercream cupcakes to remind us that spring is just around the corner and so are all the blooms that follow. This is the fourth year I’ve participated in the SPCA Cupcake Fundraiser Day. For the past several years, I’ve made white buttercream shaggy dog cupcakes with mini-M&M eyes and pink fondant tongues. This year I decided to mix it up and make chocolate, mocha, maple and vanilla furry dogs. Great to be able to help our local animal shelter. These floral cupcakes were made for the annual SPCA Cupcake Fundraiser. Today, as it’s snowing to beat the band, I decided that buttercream roses, sunflowers and hydrangeas might just be the trick to think of sunnier, warmer days…and to raise money for animals at the same time. 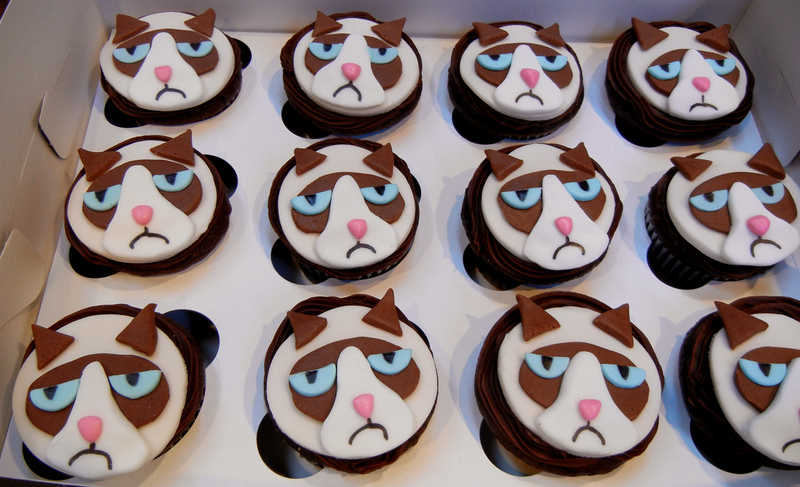 This year’s offering to raise funds for the SPCA’s National Cupcake day included a dozen dog cupcakes and a dozen Grumpy Cat cupcakes. So much fun. And apparently, they went like hot cakes…or something like that.